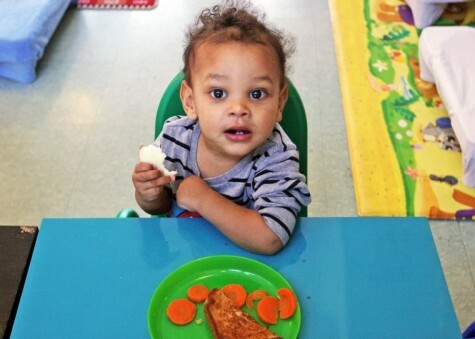 Deep Creek Country Day School in Chesapeake, Virginia is offering a healthier menu to preschoolers thanks to a Nemours-funded childhood obesity prevention program through VECF and partners (Child Care Aware of Virginia, VA Dept. of Social Services and VA Dept. of Health). The school recently received a grant from the Virginia Early Childhood Foundation in Richmond for participating in “Taking Steps to Healthy Success,” Virginia’s Childhood Obesity Prevention Program. Mariah Scaife, assistant director of the school, initiated participation in the program. “I noticed the menu here, and I thought we could be eating healthier,” she said. The grant will pay for healthy hydration in the form of a kid-sized water fountain to be installed in the play area. Another change was lemonade and juice were replaced with water. Other items off the food list include sugary cereals, chicken nuggets and french fries. School staff also purchased kid-sized cups and dishes, started family-style dining with the kindergartners and attended the Virginia Early Childhood Foundation’s five training sessions. This unique program in schools for low-income families in Texas sends fresh fruit and vegetables home with children every week, and parents are taught how to prepare and serve them tastefully. The Brighter Bites program goal is to help curb the childhood obesity epidemic with regular distribution of fresh produce and ongoing nutrition education for minority populations. Exploring Food Together is a toolkit (available in English and Spanish) from Cooking Matters of simple activities that adults who work with young children can use to help kids learn about new foods and start building the skills to make healthy food choices. All of the toolkit activities were designed to integrate with overall curriculum objectives in early childhood education settings.